VANCOUVER, Wash. – Drought could render the U.S. Northeast’s mixed forests unsustainable after 2050 while Washington’s Cascade Mountains may require tropical and subtropical forest species, according to researchers using a new type of mathematical model at Washington State University. Details of the WSU team’s work are available online in Global Change Biology (http://onlinelibrary.wiley.com/wol1/doi/10.1111/gcb.13291/abstracthttp://onlinelibrary.wiley.com/wol1/doi/10.1111/gcb.13291/abstract). 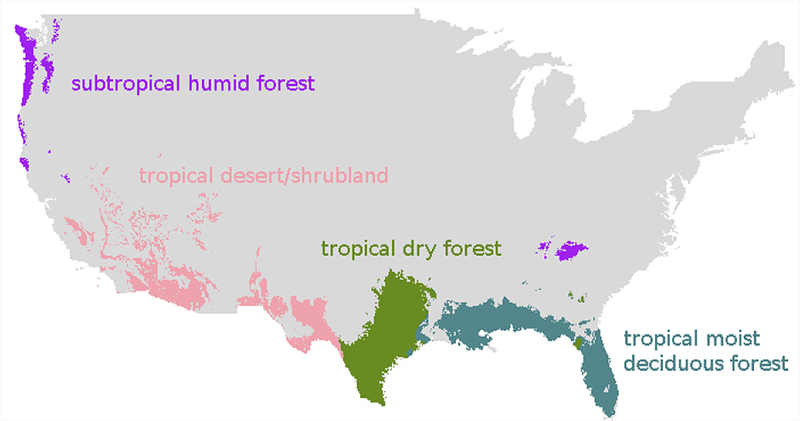 Predicted forest types in the U.S. for projected climates determined by the WSU tolerance model. Read about earlier forest modeling work by Liénard and Strigul at https://news.wsu.edu/2016/02/24/145871/.